Throughout this past year, Georgia Southern has grown to encompass three unique campuses. Auxiliary Services is evolving to accommodate the growing university and to make your college experience unforgettable. Please note the changes to Auxiliary Services departments on the Armstrong Campus. 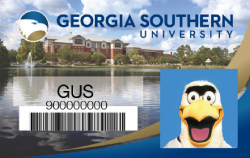 Beginning July 1, all Georgia Southern students, faculty and staff will utilize Eagle Cards for access on and around campus. Pirate Cards will need to be updated to Eagle Cards. Simply visit Eagle Card Services to update your Pirate Card quickly and conveniently. Don’t hesitate to get your Eagle Card made as soon as possible. Your Eagle Card will serve as your primary source of identification at the university and will give you access to your residence hall, Dining Plan, EagleXpress, Library and entry to other facilities. Also beginning July 1, all Pirate Cash will become part of the University-wide EagleXpress program. EagleXpress allows users to pay for food, books, supplies, medicine and other services throughout Georgia Southern campuses as well as at many off-campus vendors. EagleXpress users can load money through My.GeorgiaSouthern, at the Armstrong or Statesboro campuses Eagle Card Centers, or at the kiosks in the Armstrong Campus Library and Learning Commons, or Statesboro Campus Dining Commons. Students on the Armstrong Campus who need to access WEPA printing funds should click here. WEPA funds are still available through the new Eagle Card portal. Please note, Eagle Card Services on the Armstrong Campus is currently located in the Student Union but will move locations next to the Fine Arts building this summer. Iris camera technology for hygienic, hands-free access, will be coming to some facilities on the Armstrong Campus soon. The Galley will remain the premiere dining location on the Armstrong Campus, while several national brands such as Chick-fil-A and Starbucks will soon make their debut. GUS Mart convenience stores will replace the Pirate Pantry, and the MCC Southern Cafe will become University Court. University Court will be home of the new Chick-fil-A, Union Deli sandwich shop and future Starbucks kiosk. 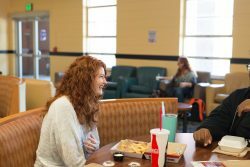 All Dining Plan holders will have unlimited access to The Galley on the Armstrong Campus as well as to Dining Commons and Lakeside Dining Commons on the Statesboro Campus. Blue Tie Catering will operate on both the Armstrong and Statesboro campuses beginning this summer. Beginning July 1, Pirate Cash will be converted to EagleXpress which can be used at all on-campus retail locations as well as at many off-campus vendors. All required texts for students taking courses on the Armstrong or Liberty campuses will be available at the Armstrong Bookstore located in the Student Union on the Armstrong Campus. All required texts for students taking courses on the Statesboro Campus students will be available at the University Store. Printing and Postal Services will now offer an extended range of services on the Armstrong Campus. In addition, the department is now hosting a courier service for faculty and staff to send inter-campus mail. For full details on that service, please click here. 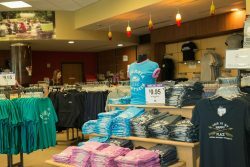 Students enrolled at the Armstrong and Liberty campuses can also purchase products from Tech Corner, Georgia Southern’s favorite Statesboro Campus technology store. Visit their website at GSTechCorner.com for more information about computers, tablets, headphones, warranty-related service and more. Decal Free’s the Way To Be! Beginning this fall Parking and Transportation on both the Armstrong and Statesboro campuses will operate under the License Plate Recognition (LPR) software, making parking at Georgia Southern an easy, decal-free process. For the remainder of summer 2018, however, both campuses will still require parking decals on all vehicles. To purchase a parking permit, log onto My.GeorgiaSouthern and click the “Parking and Transportation” tab. The “Statesboro Campus Permit” offers parking access on the Statesboro, Armstrong and Liberty campuses. 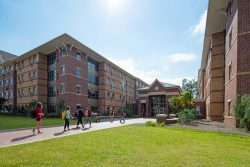 The “Armstrong Campus Permit” offers specific access to only the Armstrong and Liberty campuses, at a reduced rate from the “Statesboro Campus Permit.” All University students, faculty and staff have the option to purchase either permit. Please note, only Statesboro Campus Permits are lot-specific. 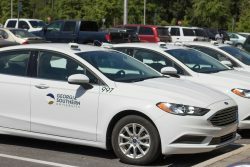 On both the Statesboro and Armstrong campuses, only one registered vehicle per customer is allowed on campus at a time, even if multiple vehicles are registered with Parking and Transportation. Students, faculty and staff are never allowed to park in visitor parking spaces. The 30-minute parking spaces can be utilized by faculty, staff and students only to conduct business or run errands on campus. These spaces cannot be used to attend class or work, and motorists may not move from one 30-minute spot to another to avoid a ticket. Motorists may park in any commuter or faculty/staff space only after 4 p.m. This does not include residential lots, reserved spaces, disabled spaces, service and delivery space, etc. Residential parking lots are enforced 24/7, and a permit is required to park in these areas. On the Armstrong Campus, if a vehicle becomes disabled and cannot be moved, drivers should call the Parking Office at 912-344-3524 immediately. Parking and Transportation will add your vehicle to the Disabled Vehicle Log, and the driver will be given 24 hours to have it moved. On weekends and at night, drivers should call Public Safety at 912-344-3333 for these concerns. Upperclassmen living on-campus are not required to have a Dining Plan. You can view additional information about FYLOR here.